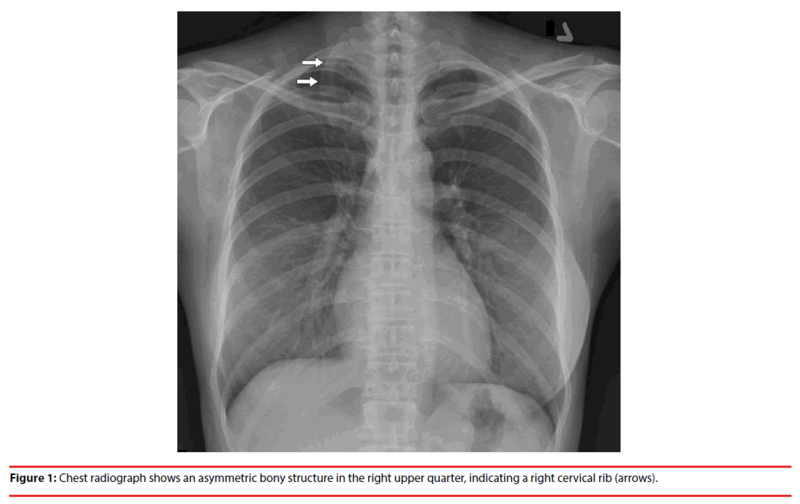 A chest radiograph performed during a health check-up of a 42-year-old woman showed a near normal appearance; however, there was an asymmetric bony structure in the right upper quarter, which connects with the cervical vertebrae (Figure 1). There was no pain, numbness or tingling, muscles wasting or weakness, or cold hands, swelling, or blanching. The lady had no specific complaints and her physical examination was unremarkable. Figure 1: Chest radiograph shows an asymmetric bony structure in the right upper quarter, indicating a right cervical rib (arrows). In the present case, a right cervical rib, which arises from the seventh cervical vertebra, can be seen. Cervical rib is estimated to be 0.5-1% prevalence in the general population . Although cervical ribs are usually asymptomatic, they can cause thoracic outlet syndrome (TOS) by compression of the brachial plexus or subclavian vessels . TOS is usually classified into arterial, venous, and neurogenic types and neurogenic TOS is the most common, accounting for >90% of patients . TOS may lead to severe and irreversible complications such as muscle wasting, stroke, and critical ischemic limb [4,5]. A careful musculoskeletal, neurological, and peripheral vascular examination is required for these patients. Wei-Tse Hsia, Chun-Han Liao, and Te-Chun Shen wrote the report. Te-Chun Shen provided the picture and planned the report. Brewin J, Hill M, Ellis H. The prevalence of cervical ribs in a London population. Clin. Anat 22(3), 331-336 (2009). Ferrante MA. The thoracic outlet syndromes. Muscle. Nerve 45(6), 780-795 (2012). Sanders RJ, Hammond SL, Rao NM. Diagnosis of thoracic outlet syndrome. J. Vasc. Surg 46(3), 601-604 (2007). Mazzaccaro D, Carmo M, Dallatana R, et al. Critical ischemia of the left arm caused by thoracic outlet syndrome (TOS): case report and review of the literature. Minerva. Cardioangiol 61(3), 372-374 (2013). Meumann EM, Chuen J, Fitt G, et al. Thromboembolic stroke associated with thoracic outlet syndrome. J. Clin. Neurosci21(5), 886-869 (2014).